If you were wondering why I haven’t posted for a month and a half… you can blame Gyft. Gyft with their nefarious plans to make spending so sinfully easy for Bitcoiners, their beautiful mobile app that organizes all my gift cards, their numerous retailers and restaurants taunting me. My failed attempts of frugality left me no options. I was on a road of consumption people, paved in beautifully digital gift cards. Ok hyperbole much? Dramatics aside, I am in love with Gyft. By accepting Bitcoin, they didn’t just open the door for Bitcoin spending, they took dynamite to the wall and busted the market wide open. We’ve eaten at Chili’s, Burger King, shopped for groceries and school supplies at KMart, and I won’t even get into our Amazon obsession (with Prime, it’s dangerous territory.) All using Bitcoin and Gyft. Daily shopping is great, but the best aspect of Gyft, by far, is the ability to share your gift cards. And it is stupid easy to do so. 2 weeks ago, the Bitcoinettes were vacationing in California, and went to Disneyland with their grandparents. My parents mentioned they might eat lunch at Downtown Disney. 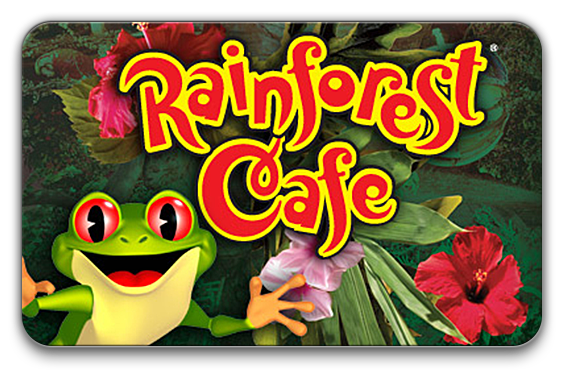 So I bought a Rainforest Cafe card through Gyft, and promptly sent it to my Dad as they were eating. He downloaded the app and redeemed the card at the end of their meal. I was able to treat them to an impromptu lunch within minutes of considering it, flawlessly. That’s just bananas. THIS is what I love about the Bitcoin movement, and the awesome companies that are choosing to integrate it into their business. It all just makes sense, and works so well. If you haven’t tried Gyft yet, you are missing out on a spectacular experience. If you ever bought Bitcoin in its entire history and held on to it, then you have watched it increase or even sky rocket in value. There was only ever a two week window in April of 2013 where the price was higher than it is right now. Hopefully that changes in just a few weeks when the price goes from 210 beyond 260 where it was in April. I sadly lost money and have been shy to spend it. Just holding onto it for 6+ months. If this Gyft card works so well and I can buy all these things I would have bought with cash anyway, but now with Bitcoin, then I will probably just start dumping all the money I am comfortable with into Bitcoin. I just held back, because there are so many fees to get my cash converted to Bitcoin in the first place. It’s hard to commit to the fact that I believe it will keep going up. It went from 0.08 cents all the way up to $260.00. It’s just mind boggling. I feel like I am way too late to the game. But I’ll give this Gyft thing a try. Once more women really get involved it could go crazy again. Very exciting.